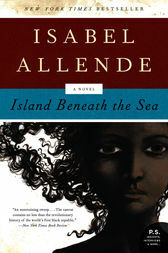 From the sugar plantations of Saint-Domingue to the lavish parlors of New Orleans at the turn of the 19th century, the latest novel from New York Times bestselling author Isabel Allende (Inés of My Soul, The House of the Spirits, Portrait in Sepia) tells the story of a mulatta woman, a slave and concubine, determined to take control of her own destiny. Tragic and engrossing story you&#x27;ll find hard to putdown. One of her best novels.